Is the word “Marijuana” Racist? By William Breathes on September 26, 2014 Culture, Say what? It’s a debate that has raged for years: is the word “marijuana” racist? No, but plenty of people will tell you that it is because it’s rooted in the dark ages of cannabis history when white America began to purposefully associate cannabis with brown-skinned Mexicans as a way of creating more of a racial divide between the two cultures. It’s something we’ve examined in detail for more than two years in our Cannabis Time Capsule blog over at Westword.com. So does “marijuana” have a dubious history as a word? Yeah. But is it racist? No. We’ve moved past all of that and the term — which wasn’t racist then — stuck. But you’ll still get the cannabis activist holdouts with no sense of humor or history who swear up and down that it’s racist to call cannabis “marijuana” or get offended when you refer to ganja as anything but “cannabis”. Case and point? 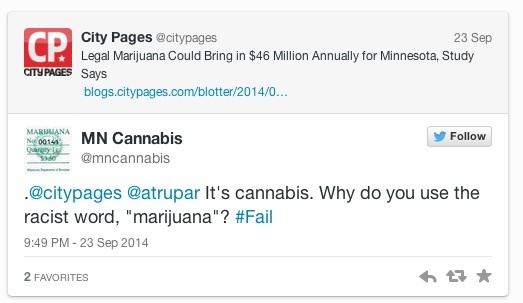 Whoever runs the @MNCannabis twitter handle. Read more at the Minneapolis City Pages.